Calibrating a seed drill before planting is an important task that can help to maximize the success of your forage stand. Economically speaking, if the equipment is not properly calibrated, you risk losing money by planting either too much or too little seed. Planting lower than the recommended seeding rate may compromise your bottom line by allowing for weed competition within the stand. This leads to both lower yielding and lower quality forage. Meanwhile, planting more seed than required is an unnecessary means of increasing establishment costs. Table 1. Recommended seeding rates and seeding depths of common forage crops. Adopted from Forage Crop Pocket Guide by D.M. Ball, C.S. Hoveland, and G.D. Lacefield. Preventative maintenance is often overlooked and can lead to equipment failures, malfunctions, and increased depreciation. It is good practice to spend a little extra time caring for you machinery to ensure its proper function and to help increase its lifespan. The first step to equipment maintenance is always to read the operators manual. The manual gives both safety information and instructions on how to properly maintain the drill. A few key maintenance objectives should be to check the tire pressure on all wheels, grease all fittings, and oil the drive chains. The next step is to check the function of some of the key working parts of the drill such as the feed slides, the no-till coulters, the double disc openers and the press wheels. If there is any wear on the double disk openers, it is recommended that those be replaced. Finally, maintenance of the seed box and seed tubes is of critical importance for proper establishment. A shop vacuum or air hose can be used to clean out old seed or debris. It is also not uncommon for insects such as spiders and mud daubers to build nests in the seed tubes which can ultimately block seed flow and prevent proper seeding densities. 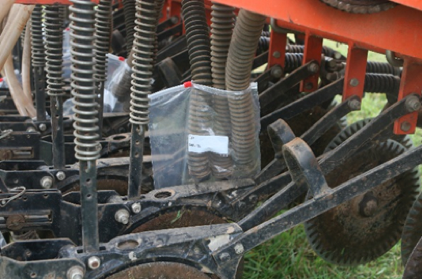 The first step in determining the seeding amount is to set the seed gate to the recommended setting for the particular seed you are planting. Most drill manufacturers provide a meter setting chart. Although this chart can be helpful and is a good place to start, drill wear and condition can often times make it inaccurate. Once the seed gate has been set, pull the drill or turn the drive wheel so that the seed flows freely though the machine. Next, detach the seed tubes at the top or bottom and place a collection device such as a cup or ziplock bag to the drill (Figure 1 and 2). A common practice is to catch 40% of the row openers. However, if the drill has uneven wear and you know some rows may plant heavier than others, catching all of the seed from all of the row openers is recommended to ensure a more accurate calibration. 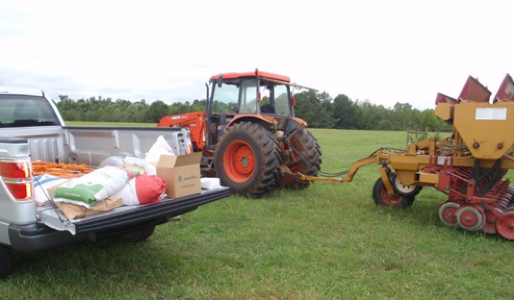 Once the seed gate has been set and the collection devices are in place, it is time to drive the machine (or turn the drive wheel) the appropriate distance. For best results, travel at a speed that will be replicated during the actual planting. If the calculated seeding rate is more than or less than the recommended rate, adjust the seed gates and retest. Ensuring that a drill is properly calibrated is a quick and easy means of promoting the success of a forage stand. A grain drill has a seeding width of 10 feet. After running the grain drill for 100 feet and collecting the oat seed, you found that you collected 2.89 lbs of oat seed. What is the seeding rate? Figure 1. Collection bags attached at the bottom of the seed tubes. Figure 2. 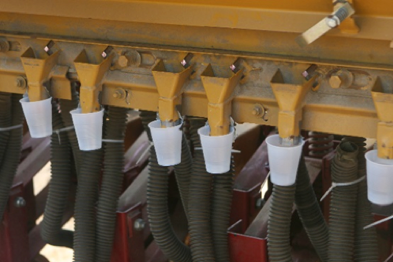 Collection cups attached to the drill at the row openers.